Shane Claiborne, a prominent Christian activist and best-selling author, will deliver two lectures in October at Emory. Adapted from his 2008 book of the same name (co-authored with Chris Haw), Claiborne’s "Jesus for President" aims to cut through the current noise of talking heads telling us about Democrats and Republicans to explain that our actions in the voting booth are less important than our actions on all other days. Claiborne will talk about what would make up the platform of Jesus and discuss how we can accomplish that mission in the world today. In "Resurrecting Church," Claiborne will share how his experience as an advocate for the homeless reshaped his understanding of what it means to be the Church in the world. This talk will bring in both early Christians and their lives and contemporary stories of "ordinary radicals"—Claiborne’s term for Christians who try to change the world around them through love and service. 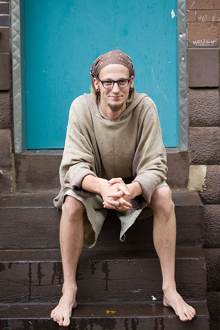 Kevin Crawford says that reading the books of Shane Claiborne ruined his life—in the best way possible. "The message is loud and clear," says the second-year master of divinity student at Emory University’s Candler School of Theology. "If there is a love in your heart, a passion to do something for somebody with a deficit or need, then act on it. Do it." Claiborne, a prominent Christian activist and best-selling author, will bring that message to Candler. Admission to both events is free, but advance registration is required for each. Register for "Jesus for President."